Perhaps one of the oldest and greatest traditions of ocean-going folk is to debate which of the ocean’s vast selection of odd-ball creatures is the ugliest. 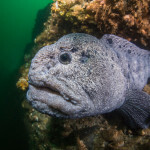 In the Pacific Northwest, however, the debate has long been put to rest – everyone agrees that the world’s ugliest fish is the wolf eel (Anarrhichthys ocellatus). 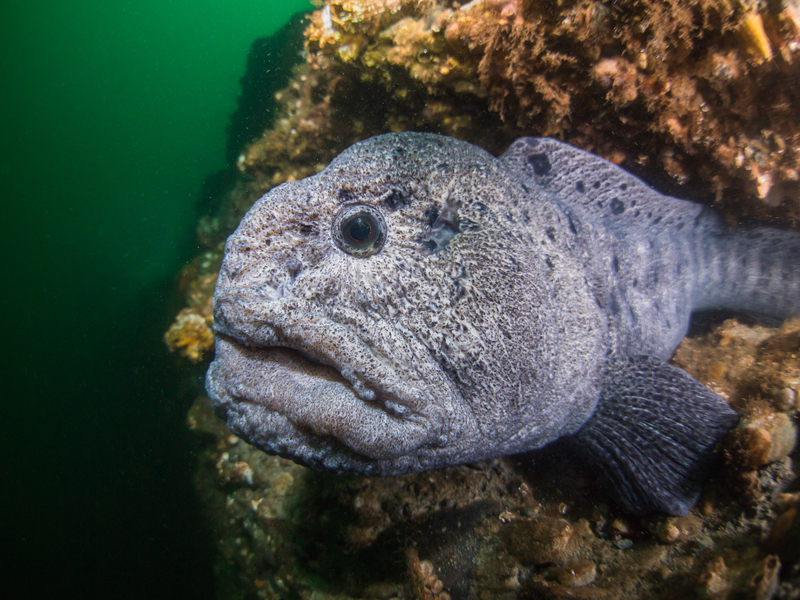 Known fondly by divers as “wolfies,” wolf eels are the second most charismatic underwater creature accessible to divers in the Northwest (after the Giant Pacific Octopus). 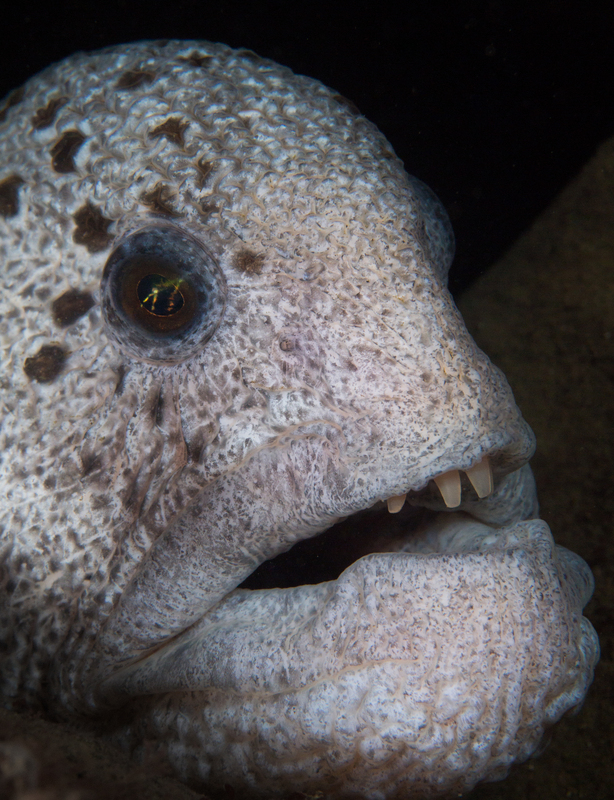 Despite the name, wolf eels are not true eels, though they do have long, slender bodies and sharp canines. Though predatory, most of their diet consists of shellfish like crabs and urchins. They break these apart with their strong back molars. Most actually have very friendly dispositions. In fact, some wolf eels have been known to allow divers to play with them and pet them (though this might be exacerbated by a history of feeding them). Though one might not expect it, wolf eels are actually very loving creatures. When a wolf eel finds a mate, it will find a suitable home – usually a hole among boulders on a rocky reef – and mate for life, living in the same hole year after year. The female coils around its eggs and takes care of them as they incubate, and the male will coil around the family and stand guard. 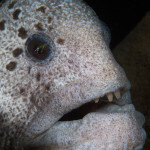 Many wolf eels are curious about divers and can come out tor great you. However, each fish has its own disposition – some get nervous and retreat into their holes. 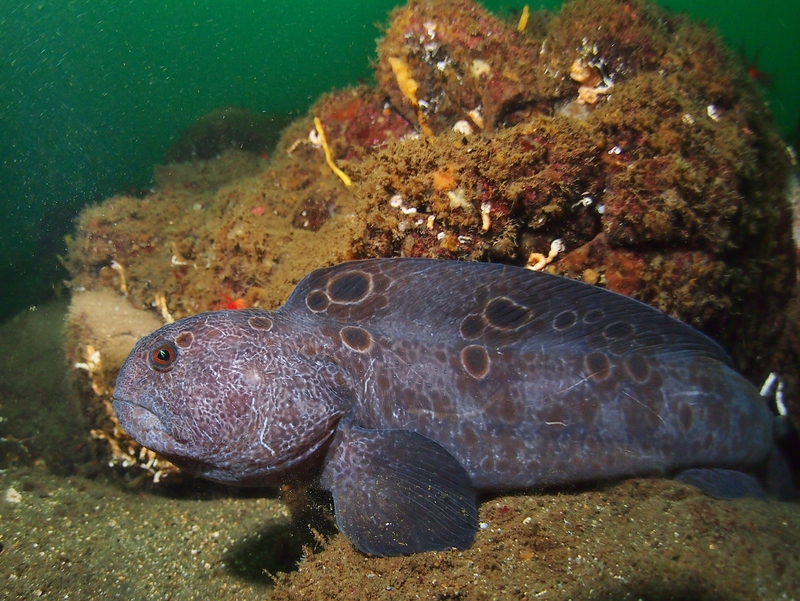 Though relatively common, wolf eels can be difficult to spot for the inexperienced wolf eel spotter, and they are frequent at only a few sites around the Puget Sound. 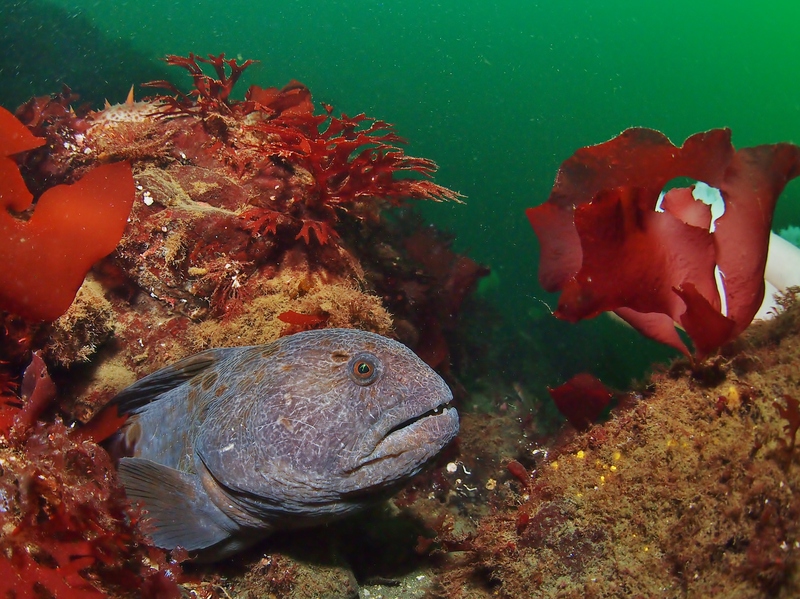 Wolf eel dens are often found in two different types of terrain – they are found in small holes in rock and clay walls (usually from a depth of 40-80ft), or they are found on rocky slopes with medium to large boulders in the holes between the boulders. Often their bodies can span two or three different holes, so you might find a tail before you find a head! The best sites in the Puget Sound are arguable Day Island Wall and Sund Rock. At Day Island Wall, some divers feed the wolf eels so they are very nice to divers. Many will swim out of their holes to great you. At Sund Rock they are shyer, but almost guaranteed if you know where to find them. I’ve seen about 10 in a dive there before. Just speak with the staff at Hood Sport ‘n Dive and they’ll put you in the right direction! 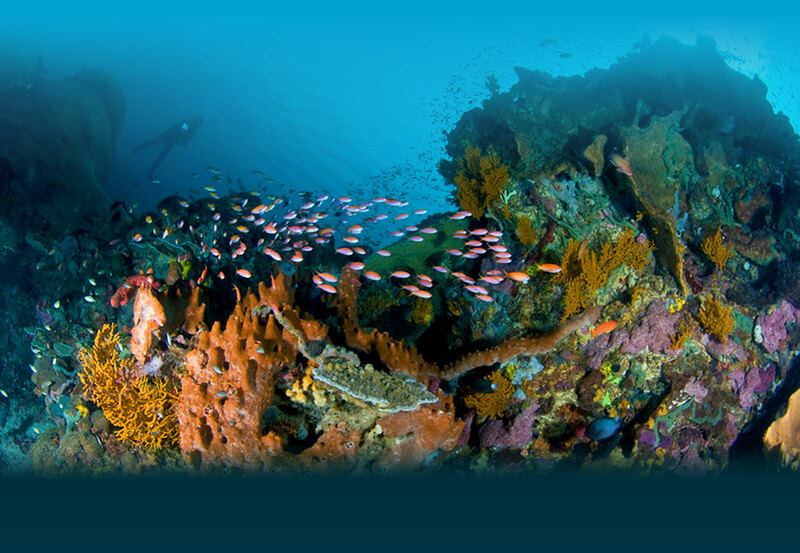 Be sure to check out our guide to Diving the Pacific Northwest! 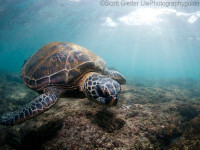 Wide angle photos were shot with an Olympus Mirrorless Camera , Panasonic 8mm fisheye lens, and dual Sea & Sea Strobes. 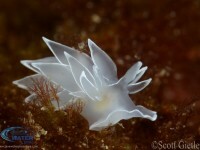 Check out Bluewater Travel to book West Coast dive trips in California. 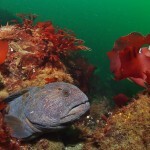 Though rare, wolf eels have been known to show up as far south as Southern California! 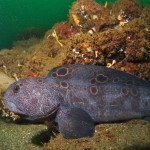 A curious wolf eel peaks out of his wall-side den at Day Island Wall, Puget Sound, Washington. A great example of a wolf eel in its den between large boulders on a rocky slope. The face only a mother could love! 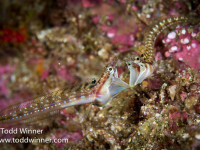 Photographed with an Olympus E-PM1 camera, 60mm macro lens, and a reefnet fiber optic snoot.